Cyberspace offers its own opportunities to preview the effects of lenses that you might be thinking of buying: welcome to the world of lens simulators. 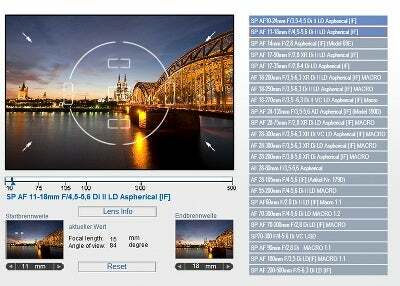 Screen-grab of Tamron’s angle-of-view lens simulator. If the review of Nikon’s Lens Simulator program on the http://imaging.nikon.com website, in the current (July 2010) issue of What Digital Camera, whetted your appetite the you may like to know about two similar lens simulators from Tamron. One of Tamron’s lens simulators echoes Nikon’s by simulating the angle-of-view for different lenses on both full-frame and APS-C sensors; the other simulates the depth-of-field that is obtained when different lenses are used at different aperture settings. As well as being able to zoom freely from 10mm to 500mm, Tamron’s lens simulators also allow users to select a specific lens to “cyber-test”. A particularly nice feature is the ability to cycle through a range of values in the depth-of-field software in Slide Show mode. Both of these lens simulators are hosted within www.tamron.eu/en/lenses but the easiest access is probably via Tamron’s UK importer’s website, www.intro2020.co.uk, where you need only click on the Tamron logo to see a link to the programs. You don’t need to be a Tamron user to enjoy the lens simulators but obviously the point of the programs is to help potential buyers make the right choice when deciding which lens to purchase. 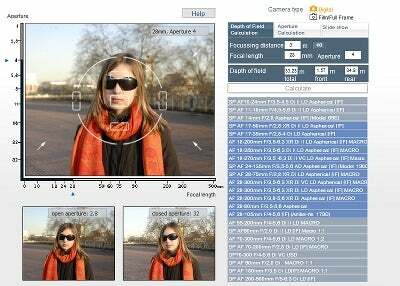 Screen-grab of Tamron’s depth-of-field lens simulator. It is clear that a lot of effort, both photographic and coding, must have gone into these lens simulators but if anybody is inclined to spend even more time on a similar project then I suggest that it would be useful to add another lens simulator that maintains the same object size in the frame but changes the camera position (and therefore the perspective) as the focal-length is varied. I have made this point before but it bears repeating: there is more to changing the focal-length of a lens that simply squeezing more or less of a scene into the picture. Equally important, and in some cases more so, is the ability to control both the amount of background that is recorded (by varying the focal-length) and its sharpness (by varying the aperture setting). That said, I strongly encourage you to play with these lens simulators (Nikon’s and Tamron’s) to see what you can learn without having to part with even one penny to invest in a new lens!